TIFFIN - Heading into head coach Morgan Shriver's third season leading her alma mater, the Heidelberg University women's basketball team is poised to take the next step towards the top of the Ohio Athletic Conference. The Student Princes return a large group of veterans from last year's squad that won a conference tournament game for the first time in 11 years at the Berg. Heidelberg returns four starters and 83% of their scoring from a year ago and will look to that leadership and experience during the 2015-16 season. The Student Princes have 12 upperclassmen on the roster that will help acclimate the new group of freshman and transfers to their system. "Having a lot of upperclassmen is really going to help lead our newcomers and transfers that can come in and make an impact," said Shriver. "They're really bonding, and you can see that on and off the court. They like to play together and be around each other, and that really carries to their on-the-court success." 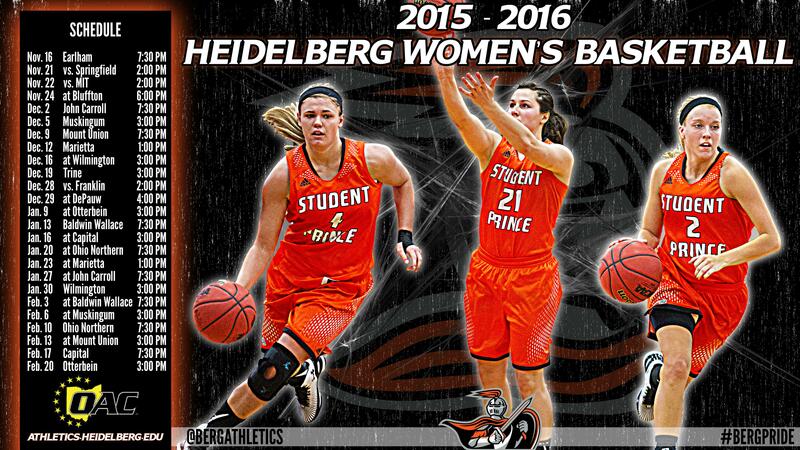 Leading the way for the returners for Heidelberg is junior Carli Patrick. She is coming off a season where she led the OAC with 10.3 rebounds per game and earned second team All-OAC honors thanks to solid rebounding and defensive play. Patrick recorded 13 double-doubles on the season and scored 9.8 points per game. The forward shot 51% from the field on the year, ranking fourth in the conference and will look to be more of an offensive weapon for the Student Princes entering her junior campaign. "Carli wants to be more of an offensive threat," said Shriver. "She always works hard, works for rebounds, and does all the little things, but now she's going to look to herself to be more of a leader offensively on the court for us this year." Theresa Jackson and Allie Hawkins are the top two leading scorers returning for the Student Princes, both having averaged double-figures a year ago. Hawkins averaged 10 points and 2.2 assists per game and will look to build upon that during her senior season. Jackson finished the season strong for the Berg, scoring over 20 points in their final two games, including 20 second-half points in the comeback victory over Mount Union in the OAC Tournament. Senior Nicole Payne will also play a big role at the guard position for the Student Princes. In her junior season, Payne averaged 4.4 points per game and shot 80% from the free throw line. Joining Patrick in the front court are seniors Marisa Liburdi and Shelby Dearth. Liburdi was a strong presence in the post last year, scoring 8.9 points per game while Dearth ranked second in the OAC with a 43% three-point percentage. With that solid core returning and a new group of student-athletes looking to contribute, the Student Princes have all the pieces in place to have a successful 2015-16 season. "I think we have a really high ceiling this year," said Shriver. "This is the closest team I've ever coached and I'm looking forward to making an impact in the conference this year." Heidelberg opens their season at home on November 16th against Earlham before traveling to New York City for a tournament on the 21st and 22nd. The Student Princes open up Ohio Athletic Conference play on December 2nd when they host John Carroll. OAC PRESEASON POLL: The Student Princes were selected to finish 6th in the preseason Ohio Athletic Conference coaches poll. Capital was selected as the favorite after falling in the title game of the conference tournament last year. For the complete OAC release, click here. SCHEDULE GRAPHIC: For a high-resolution download, click on the image below.